Time management is difficult for everyone, but for college students, it can be an obstacle. Prior to college young adults had the added support of family reminders to help them meet deadlines. Mom and Dad, who were very familiar with their child's schedule, would likely make casual comments such as, "You're going to be late"or gentle prodding with "Don't you have a test to study for?" College is different because a student is now on his or her own, and heading off to college brings on a myriad of changes. One of the biggest adjustments students cope with is figuring out how to balance a full schedule with assignments, projects, social life, family or job without that gentle prodding from everyone at home. This feeling of never having enough time is a common theme among college students, and doing the juggling act often gives a distinctive feeling of constantly being crunched for time. If you feel this way, you are not alone. There are only 24 hours in a day - you can't change that - but one thing you can do is theoretically add hours to each day through practicing solid time management. Students who develop a good time management system and live by these principles find they can balance school with other responsibilities, and perhaps even squeeze in a little time for fun. Scheduling time wisely helps you effectively manage coursework with the other areas of your life. One of the advantages of time management is you can prioritize your tasks and get them completed in a timely fashion. One of the best ways is to keep a planner or track due dates and other important information on a planner or calendar. Make it a regular habit to write down assignments, appointments and other obligations and then religiously follow your planner. Monitoring responsibilities through written organization can help you stay on top of your work. If paper calendars are not your style, try using an online calendar or email reminder. Students these days have good options, just plug reminders into a smartphone or other mobile device. Putting a visual to your due dates and other obligations is a good tool to use to strengthen your ability to meet commitments. 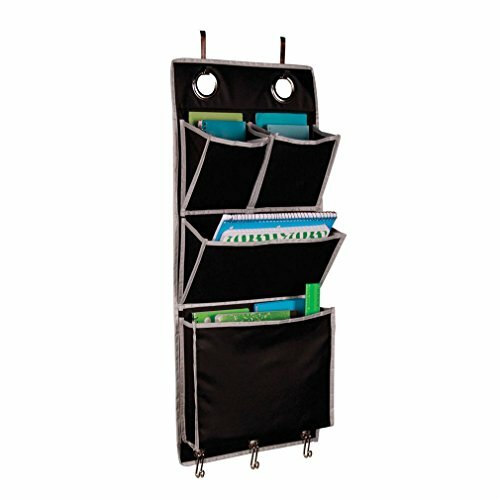 Over the Door Magazine Storage Pockets Hooks Books Organizational Back to School Office Home, 14'W x32"H, Color: Black & Silver. One of the central philosophies to good time management is to understand prioritization. This means you need to learn how to list all your tasks, due dates and other important academic obligations and figure out which ones take precedence. This is an important talent to keep in your skill-set toolbox because, if you cannot figure out which assignments and deadlines need to be completed first or need long-term consistent attention, you will have a hard time staying on track. You can start prioritizing by planning each day the night before; this way you know ahead of time what's coming up the following day and you can schedule which assignments to read or write out first and tackle them in order. Establishing your short and long-term goals is another facet of prioritization. You can even use your planner to do this. Once you have a visual of everything you need to do, you can organize them in order of precedence and focus on those first. This is helpful so your long-term projects and assignments don't get lost in the shuffle. The art of multi-tasking is another time management skill which is a good one to acquire. Some people may argue multi-tasking isn't a good practice but, in my opinion, sometimes it is necessary. This doesn't mean you should stretch yourself so thin you have trouble concentrating, but rather smart doubling up on time. For instance, tote a book or some notes along when you do your laundry, this way you get two tasks completed at the same time. Parents who are in school can bring along a text or notes while waiting for their kids' school or practice to let out. If you have a long ride where you're the passenger, bring along something to study. Every bit of time saved can help reduce that feeling of time crunch. While it's true multi-tasking can have the opposite effect and make you distracted, if you carefully plan how you're going to multi-task, it can be a real time-saver. Cramming tends to put your brain on overload, end up tired and not absorb as much as you could have by taking on work at a steady pace. Cramming can lead into bad study habits which can impact your grades over the long-term. Avoid last-minute cramming sessions for tests and completion of projects because slow and steady wins the race; if you wait until the moments before your deadline, you are going to put yourself under unduly stress. To eliminate the temptation for cramming, try outlining your long-term assignments and semester chapters and break them up into segments. Set due dates for each segment if that will help you stay on track. Once you do this, you break long-term goals into short-term ones and into more doable blocks of time. This way when your big test day arrives or a semester project comes due, you'll have been steadily working all along and the pressure will be off when trying to finalize your work. Practicing time management will not only benefit your academic career, it will help your social life too. Students who feel pressured and stressed out are more tempted by invitations and other social events, putting off work even further; this can lead to a problematic situation. Changes can be overwhelming. Trying to adjust to a new routine with additional responsibilities is stressful. Whether going to school as a traditional full-time student, taking one or two classes part-time, are a nontraditional, or a distance learning student, all students can benefit from acquiring strong time management skills. Degree programs are time-consuming, and developing solid time management will help increase productivity and decrease academic stress. Balance is the key to successful time management. When you're in college, time is one luxury often lacking, but strong time management skills can help you put some extra hours back into your schedule. Try to develop strategies that work for you, and then stick with them. It won't be long before you find how valuable these skills are to have to keep both your personal and academic goals on target. Once you learn how to budget your time and maximize each hour to the fullest, you'll find you can get your work done and likely find you still have a little time for some fun too.